Fierce. For those whose lives have been touched by cancer, this word is more than appropriate to describe the ways in which people change in the face of illness. But there is more to being FIERCE, than just the physical aspects. FIERCE® is a hybrid fitness class and support group held the first and third Wednesday of every month in the Enlighten Studio, from 6:15-7:45 pm. Started in October of 2014, the group was introduced to create a more active support group for the community. As a collaboration class between Raintree Athletic Club and instructor Alene Nitzky, Ph.D., RN, OCN, this unique class offers both physical and emotional support to cancer survivors and those still undergoing active treatment. “These are the things people struggle with after they are diagnosed and go through treatment for cancer. The process of going through cancer treatment is not over when they finish their last chemo, radiation, or surgery. Effects of treatment linger on, especially fatigue, but there are many other things people struggle with,” said instructor Alene. 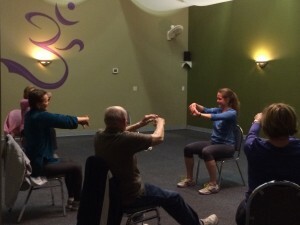 The class focuses on gentle exercises led by Alene, who is a certified ACSM cancer exercise trainer and has worked extensively as a fitness trainer for those with chronic health conditions. Alene’s professional nursing experience, coupled with outside speakers brought in to guide class sessions, provide education and hands-on support to attendees. Although this is Alene’s only here at RAC, she also runs a prolific external business called Cancer Harbors where she works with patients worldwide. Alene champions the cause for ongoing prevention and general wellbeing. Her class is open to all cancer survivors, although those currently undergoing treatment must provide a note from your oncologist to ensure safety. Alene Nitzky, Ph.D., RN, OCN is facilitator of the FIERCE active cancer support group. Contact her at 970-372-7330 or info@cancerharbors.com.